The John Lewis & Partners Roof Garden is open on Oxford Street for another winter run, this time with food from MYPIE, warm gin cocktails from Sipsmith, and an ice skating rink, with bookable sessions costing from £6-£8. There are also bookable cabins - book for 6 or 12 people by emailing bookings@mypie.london. Looking forward to visiting! 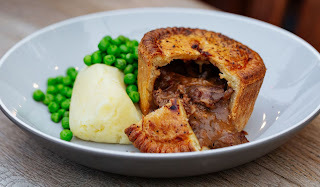 Formed in 2014 by school friends Chris Brumby and Jim Carnegie, the Australian duo found a gap in the UK market for high quality pies. Now trading from a couple of vans, pop-ups and soon to open a wholesale bakery, MYPIE are true innovators in the pie world. Top off the perfect winter day out with a leisurely skate on the Sipsmith rink. Set against a spectacular London backdrop, it’s festive fun at its best. When you've finished skating, treat yourself to a hot gin and enjoy the view."